The Women of InfoComm Network will convene at Integrated Systems Europe 2016 in Amsterdam. The group held its inaugural meeting at ISE 2015. The working session for current and prospective WIN members, as well as others interested in supporting and mentoring women in the AV/IT industry will be held over breakfast on Wednesday February 10 from 7:30 to 9:00 a.m. in the Café Amsterdam at the RAI Amsterdam Convention Centre. WIN members Sarah Joyce, managing director of Electrosonic, and Jane Hammersley, European business manager for TD Maverick and member of InfoComm International’s Leadership Search Committee, organized the breakfast at ISE and will help guide the proceedings. WIN leaders have invited graphic recording artist Birgit Smit to allow members to visually see their ideas. Through Smit’s illustrations, created live during the breakfast, participants will be engaged by the morning’s event and be able to visually see key takeaways. The organizers say that in addition to the working part of the breakfast, there will time set aside for networking and meeting colleagues. 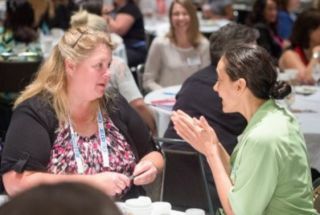 The Women of InfoComm Network was created to provide a global community of InfoComm members and other professionals committed to supporting and empowering women who work in the technology and AV industry. Since its inception, WIN has hosted activities and events throughout the world, including trade shows in Europe, United States, Mexico and India. Interested professionals – women or men – can join today and follow the council’s activities through its LinkedIn Group.